Suddenly it seems people who should know better are caught plagiarizing and doing it from well-known sources. Specifically Fareed Zakaria and Jonah Lehrer. Zakaria is a high profile deep thinker on international politics. He admitted to grabbing whole paragraphs from New Yorker writer Jill Lepore on gun control. His punishment? Suspension as editor-at-large for Time Magazine and of his program on CNN. Jonah Lehrer was considered an up-and-comer. His act of commission was slightly more subtle, but just as guilty. He made up quotes from Bob Dylan in a recently published book. A "Dylanologist" asked him where he got those quotes. Busted! Lehrer admitted he made them up. Lehrer had just begun a promising career as a staff writer for The New Yorker but resigned when the truth was revealed. Two thoughts come to mind: first, in the Internet Age, there are no secrets. 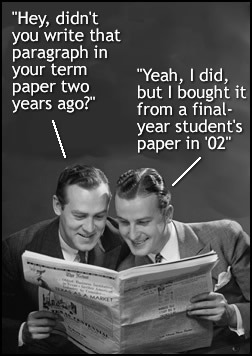 Every undergraduate knows that if a prof sniffs a hint of plagiarism, a computer program called "Turnitin.com" can analyze the writing and using algorithms, can detect and trace the origin of a too-clever turn of phrase. Second, we are seeing a new form of hubris where writers used to being praised to the heavens seem to have lost their instincts for self-preservation. Zakaria and Lehrer are not the first to do what they did. They are just the most recent and highest profile plagiarists who have been caught out. Nor are they fresh out of high school and eager to score an A on a term paper. They were at the top of their respective games (Lehrer showed more promise and for that reason alone, his stupidity is even more inexplicable). Part of the reason may be that the Internet has spoiled us. We can see our thoughts immediately translated into text and in that immediacy, something important has been lost. We have become our own editors and like a doctor who prescribes for himself, he or she has a fool for a patient. In an era of cost-cutting and instantaneous presentation of self through blogs and tweets, we have lost the social value of the second opinion. The other factor is of course, money. Some journalists are simply paid far beyond what the product they produce is worth. When that happens, those journalists tend to believe in their own infallibility. The other element is vanity. First-person reportage keeps growing as media organizations flatter journalists and encourage opinion rather than fact-based reporting. It used to be a tenet of newsrooms that a reporter never used the first person singular in a story. One off my first editors at the CBC told me that I was never to consider myself as part of the story. I was there to bear witness and if I were to suggest anything resembling an opinion in a stand-up closer, it should only be to suggest where the story might go next. Early in my career at NPR in Washington, I was invited to take part in a discussion on a TV show about politics. The host asked me on camera if I thought President Clinton was guilty and should be impeached. My response: "I wouldn't know. But here's what we've been reporting..."
great and timely piece Jeffrey.